We live in Fort Mill, SC, a suburb of Charlotte, NC. I took this photo yesterday. I know this is not the way they were designed to work against canker worm, but they are! Watch the segment on the nationally televised "Gardening By The Yard"
The BugBarrier Tree Band is designed to be attractive when installed. 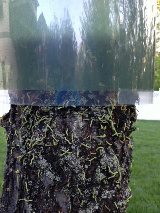 The unique design of the BugBarrier Tree Band provides an unobtrusive method to trap insects that climb on the trunk of your trees. 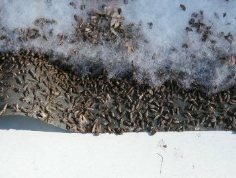 The unique inward-facing sticky adhesive does the trapping out of sight, leaving an attractive band throughout the season. 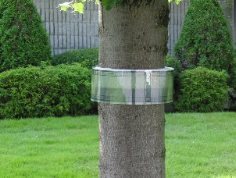 The Bug Barrier Tree Band is specially designed to stop insects from climbing your valuable trees in order to eat their leaves. You now have a tool to trap them that is clean, effective and easy to install and remove.